You probably shouldn't make it a regular thing, but when a morning of boring emails and meetings has left you exhausted at work, you'll find everything you need to catch a few minutes of shut-eye inside this $45 Emergency Nap Kit. 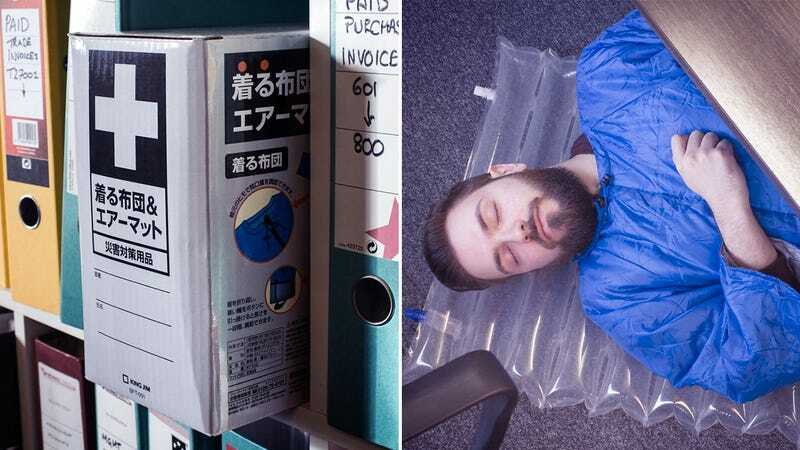 It's small enough to hide amongst the binders and mountains of paperwork on a shelf, but open it up and you'll find an inflatable air mattress for those of us without a couch in our office, or an office, as well as a full-length sleeping suit complete with sleeves. Which means the kit also serves as an Emergency Too Much Air Conditioning Kit in the summer giving you a bit of extra warmth but still allowing you the use of your arms to keep working.